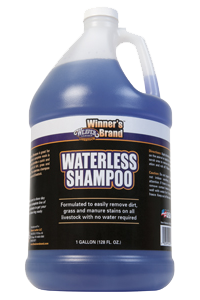 Formulated to easily remove dirt, grass and manure stains with no water required, this shampoo is great for spot cleaning when a complete wash is not necessary. Specially formulated with naturally antiseptic, antibacterial and antiviral ingredients like tea tree oil and eucalyptus, our Medicated Shampoo also conditions the skin and repels insects. Use it as needed or as a preventative measure to protect livestock from skin problems if exposed to risk. This shampoo is specially formulated to brighten and whiten while removing stains on white-colored livestock animals. It offers maximum brightening ability and nourishes the skin and hair for a healthy end result. Wash animals in under five minutes for a sparkling clean end result. Just add desired ProWash Foam Shampoo to the container, spray on and rinse off. For best results, do not pre-wet animal before use. Pre-wetting interferes with the performance and reduces the shampoo’s effectiveness. This product is ideal for use on cattle, horses, goats, sheep, swine or dogs. 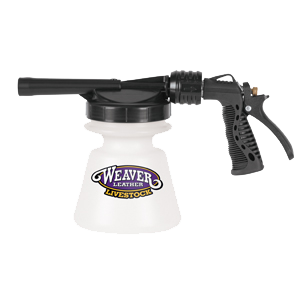 Includes container with lid, spray nozzle, on/off valve and easy connection end.